We are pleased to announce that the Summer 2015 Natural History Events Calendar is now available! From nature walks that focus on traditional plant knowledge to discussion on groundwater management, and from presentations on forest inhabitants to fun weather station demonstrations, there is something for people of all ages and environmental interests. See the details below. Our Thursday Expert Speakers Series is held in the Community School Library (entrance through the Natural History Exhibit door). Admission to all these presentations are by donation ($5 suggested). Read the 2015 speaker biographies and summaries here. The Nature Field Trips on Tuesdays are an excellent opportunity to discover shoreline and forest ecosystems as well as Hornby’s unique geology. These field trips are great fun for the whole family and will enhance your visit to our beautiful island. Pre-registration is essential as space is limited to 6 participants for each walk. 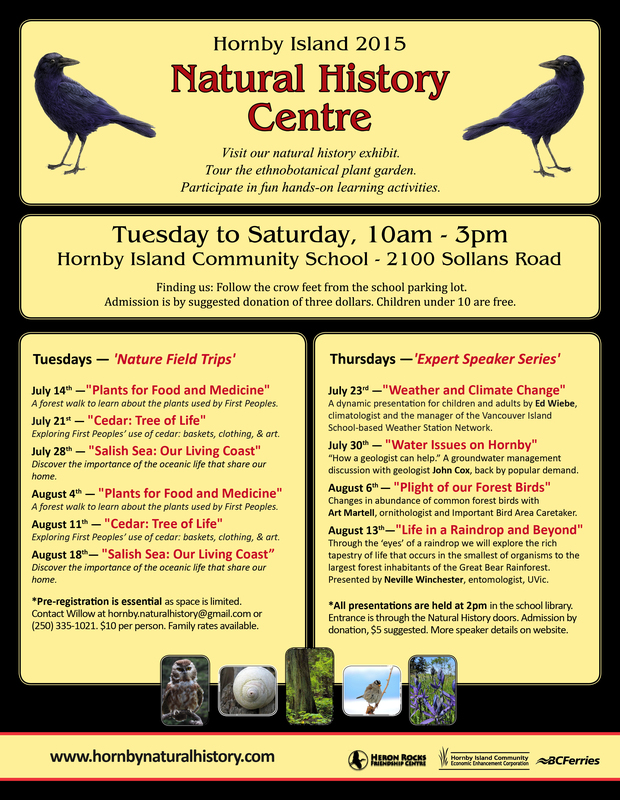 For inquiries or to register, email Willow at hornby.naturalhistory@gmail.com, call 250-335-1021, or come to the Centre. $10 per person. Family rates are available. Hi Jan, that sounds great. We should have enough copies to send you one. They are arriving soon. We’ll be in touch. Thanks! Nice poster, I’ve printed it and put it in my orientation book for my vacation rentals. Thanks!